Over the past decade, women’s basketball has exploded onto the national sports scene. WNBA and NCAA television ratings have skyrocketed; movies, magazines, and clothing lines showcase female players. But as the authors of Shattering the Glass show, women’s basketball has a much longer history, reaching back over a century of struggle, liberation, and gutsy play. Shattering the Glass offers a sweeping chronicle of women’s basketball in the United States, from its invention in the late nineteenth century to its dominant position in sports today. Offering vivid portraits of forgotten heroes and contemporary stars, it also provides a broader perspective on the history of the sport, exploring its relationship to changing ideas of womanhood, efforts to expand women’s economic and political rights, and definitions of sexual equality. 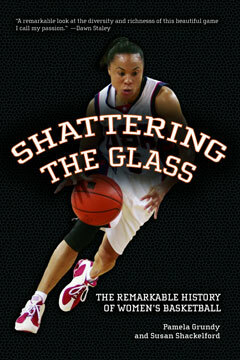 Based on original interviews with players, coaches, administrators, broadcasters, and extensively illustrated, Shattering the Glass provides a moving, gritty view of the game on and off the court, and an empowering story of the generations of women who have shaped women’s basketball. Pamela Grundy’s book Learning to Win won the 2002 North American Society for Sport History Book Award. She lives in Charlotte, North Carolina. Susan Shackelford has written on sports for the Associated Press, the Miami Herald, the Charlotte Observer, and the Greensboro (N.C.) Daily News. She lives in Charlotte, North Carolina.